For years/decades, I’ve yearned for one of those pointed oval tins for raised game pies (the type with clips at either end). Just one of those longings for a classic piece of cooking equipment that carries breaths of nostalgia and tradition. 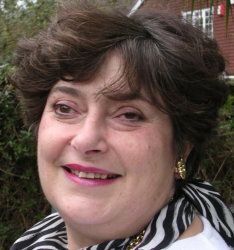 When I had the chance, I’ve scoured antique fairs without success but my longing was finally more than satisfied this Christmas by friends Sue and Joan. Heaven knows why these tins are so wildly expensive! My own version of hot water pastry to make the game raised pie included: strong white bread flour added to the ordinary plain; rubbing in butter; adding lard dissolved in hot water. A quarter of the pastry was set aside for the pie lid and the rest went in the tin. I pressed it out and gradually raise it up the sides. Just like trying to mould hot greasy and slithery plasticine! 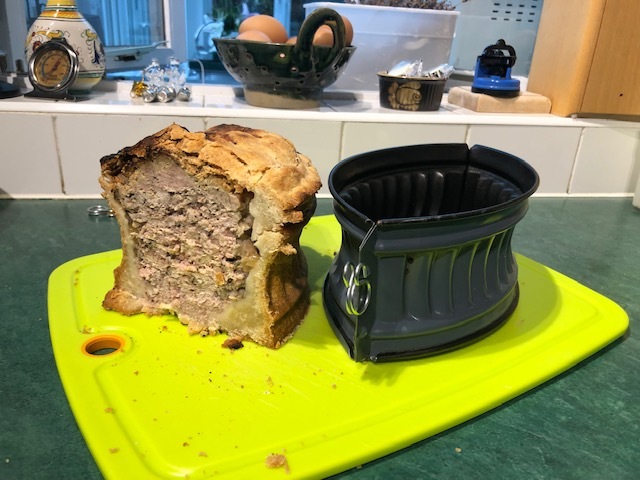 It kept oozing back down the sides of the tin and gathering at the bottom –it would have been better allowing it to cool more so it didn’t sag like Nora batty tights! Pork gave bulk to the filling: sausage meat and mince seasoned with mustard powder and ground allspice. Pork is also important in adding a little fat to keep the game moist – in this case, partridge (skinned and bones removed) marinaded with a little white wine. 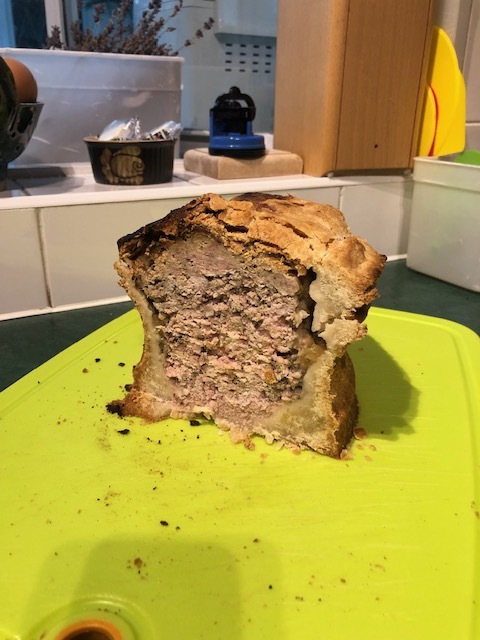 By the time I’d struggled with the pastry, rather roughly layered in the meat and topped off with the lid, I was running out of cooking time. But, even though I had to switch the oven off 30 minutes early, leaving it in the residual heat did the trick. 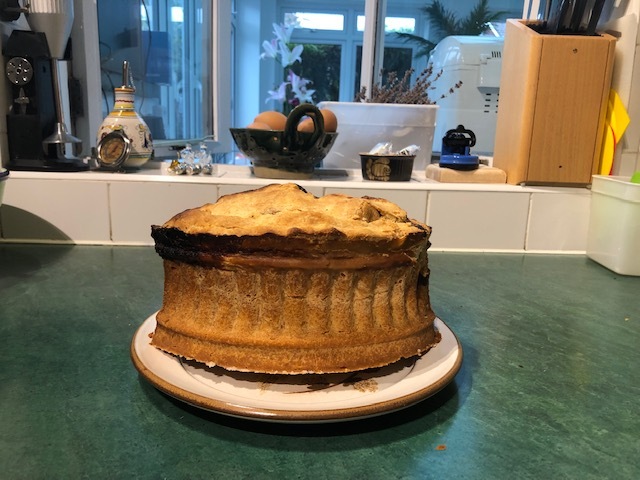 I confess that one side was a bit scorched (too near the gas), I failed to do the egg glaze and the jellied stock added later didn’t reach all the parts required or set firmly enough – it sounds like a series of disasters. But the pastry was the best I’ve ever made and the filling was deliciously moist. Definitely an experiment to be repeated in rather slower time to do more justice to that excellent tin. Meanwhile, if you are looking for another classic pork dish, look no further than this week’s video (https://youtu.be/s9ssUcVIIto) which features the first of three versions of sweet and sour spare ribs from my time in Chongqing in China. This was the recipe from the professional chef with two more homely versions to come.